Watching a remodeling project unfold week by week. Last weekend I was fortunate to actually be at the granite fabricating shop when they were cutting the granite for this counter top. It was very cool to see the slab as it was being cut. Making granite counter tops is quite an operation. In this case the process started months ago in Brazil, when the buyer chose the best quality, most beautiful granite to sell and fabricate. 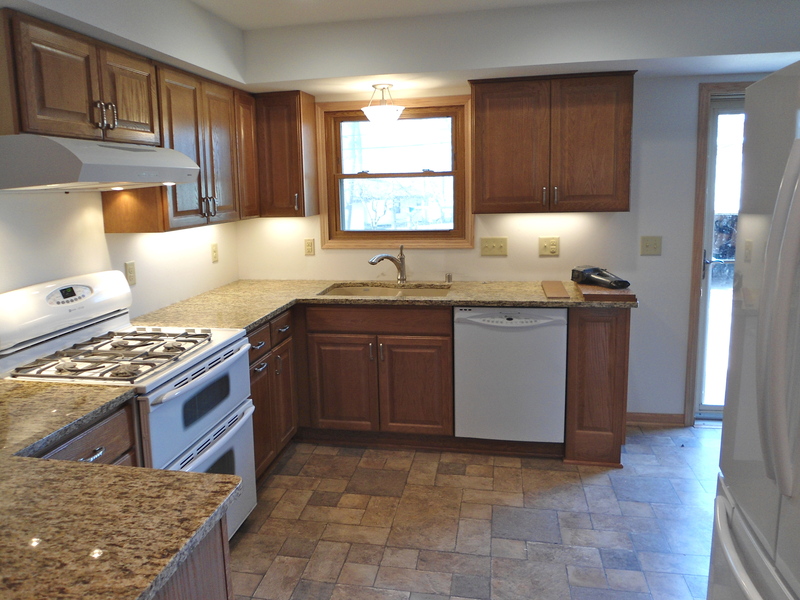 Not all granite counter tops are created equal, and the pricing structure reflects that. I like to compare the stone to precious gems. Diamonds are rare so they are expensive, garnets are not as rare and cost less, but both are beautiful. 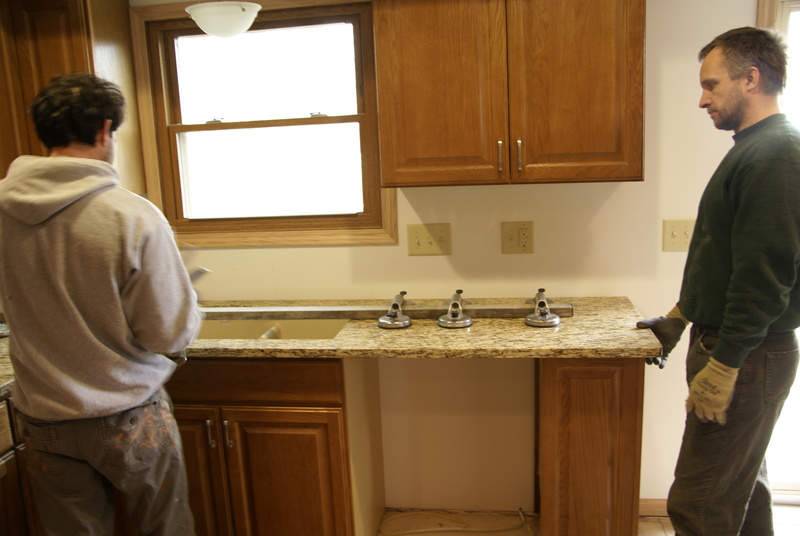 After the shape of the granite counter tops are cut out, the granite still needs to receive its edge treatment, and be polished and sealed. 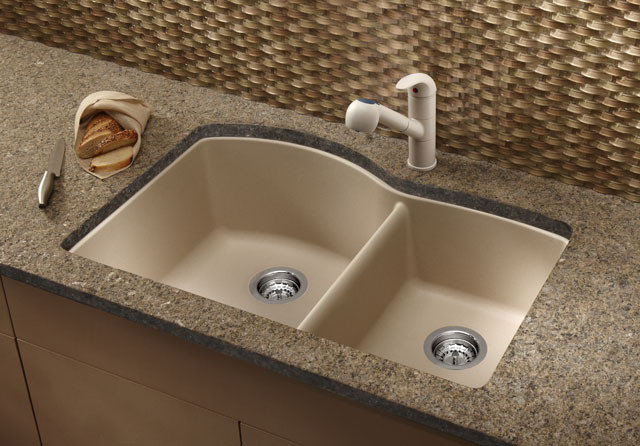 When we use solid surface counter tops, such as granite, we generally go with a undermount sink. 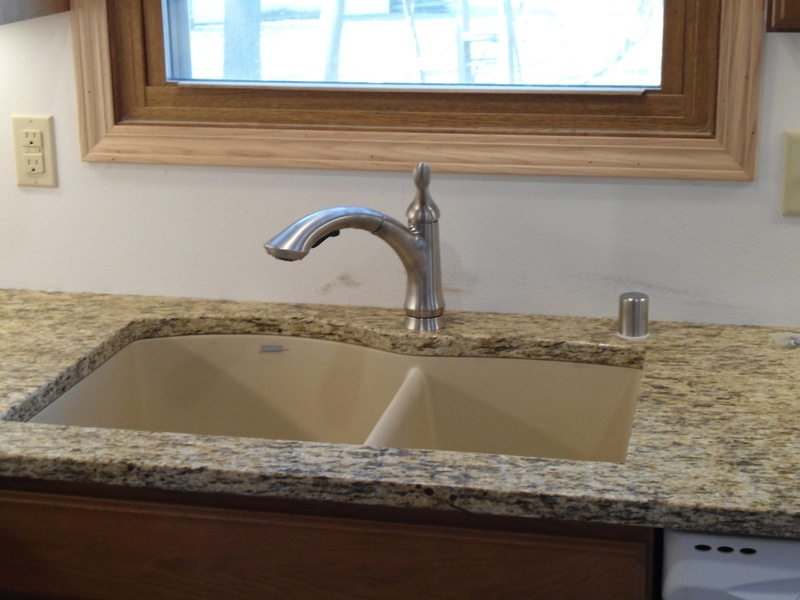 Undermount sinks are mounted to the under side of the granite so there is no lip on the sink. Not only is this a very attractive look, but it makes kitchen clean up easier as you can brush crumbs and water right into the sink. This kitchen uses a Blanco sink which is a newer man-made material that is non-porous, does not stain and is available in multiple colors. I love it because I am not a fan of Cast Iron, but with sill granite you can get a sink with a darker color. 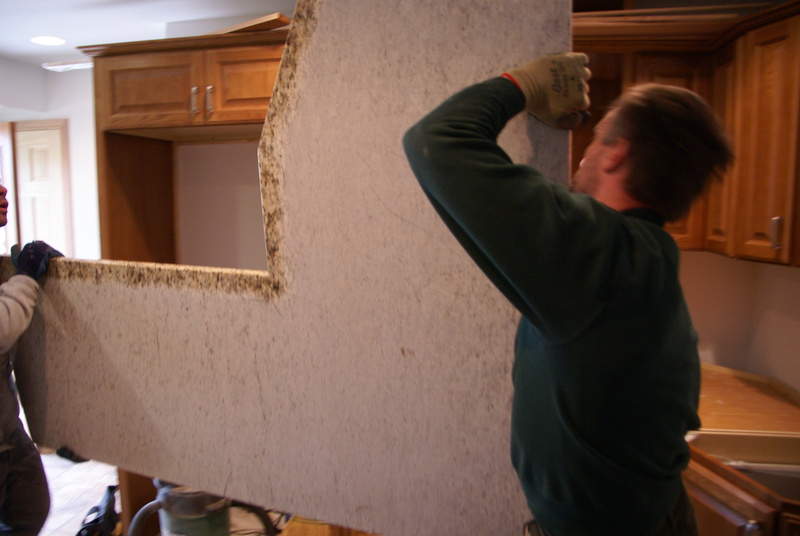 Granite installer cutting out a bit of the cabinet to make the sink work. base. 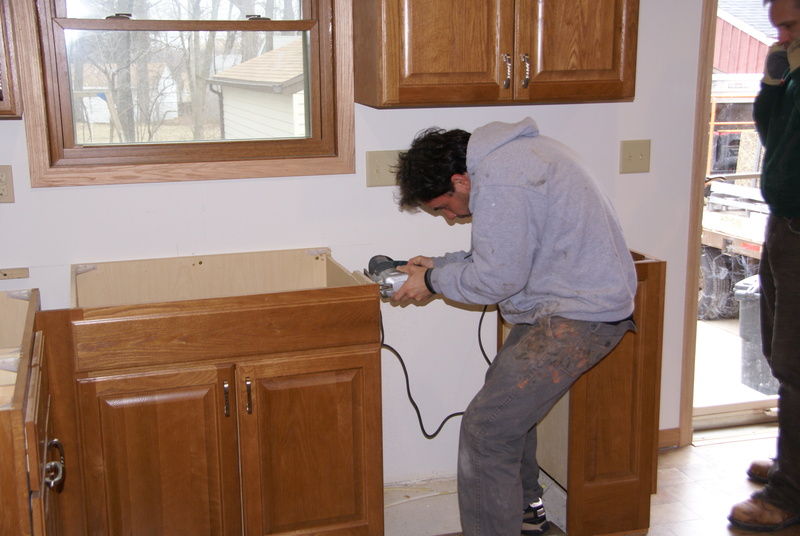 This means the counter top installer has to cut some of the cabinet out to make the sink fit correctly. 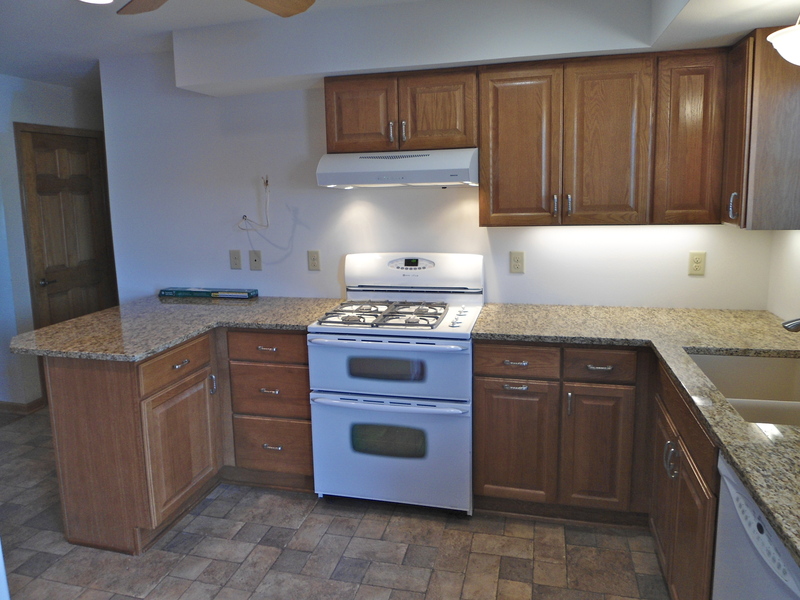 I know 3″ does not seem like much, but in a small kitchen every inch counts. 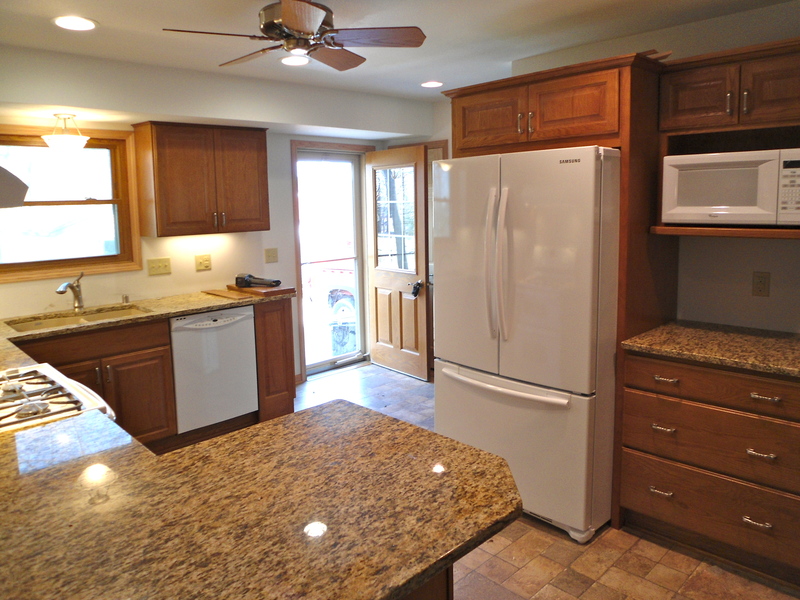 After the counter was installed, we went ahead and installed the appliances. 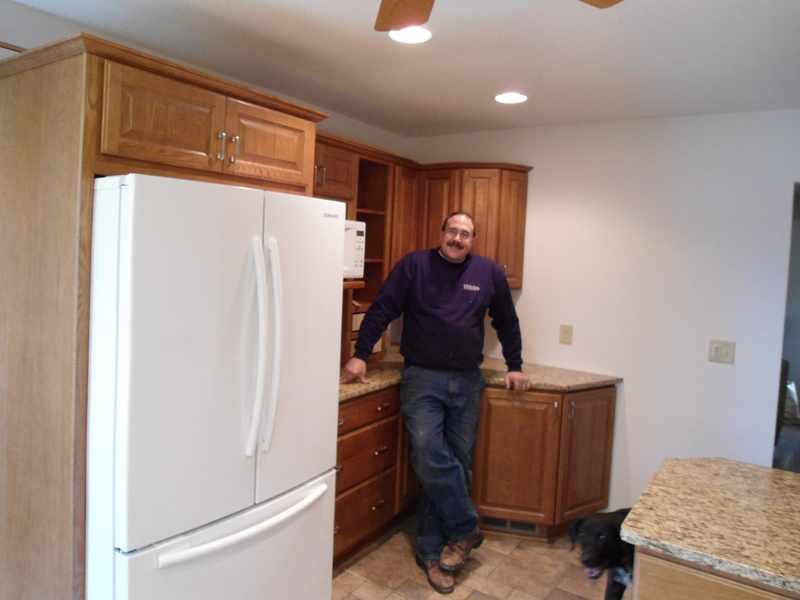 Now even though we are still waiting for a cabinet and some other cabinet parts the homeowner can enjoy the kitchen. Granite being carried into the house. Oh, that missing cabinet is starting to upset me. Luckily it is being delivered this week. Sink and faucet. There is no granite backsplash because we are installing a Travertine tile splash. “Joe, get out of the way I wanna see the counter.” Can you see Lucy, the dog? Nice wide counter on the Peninsula. Notice how open it is to the back door. 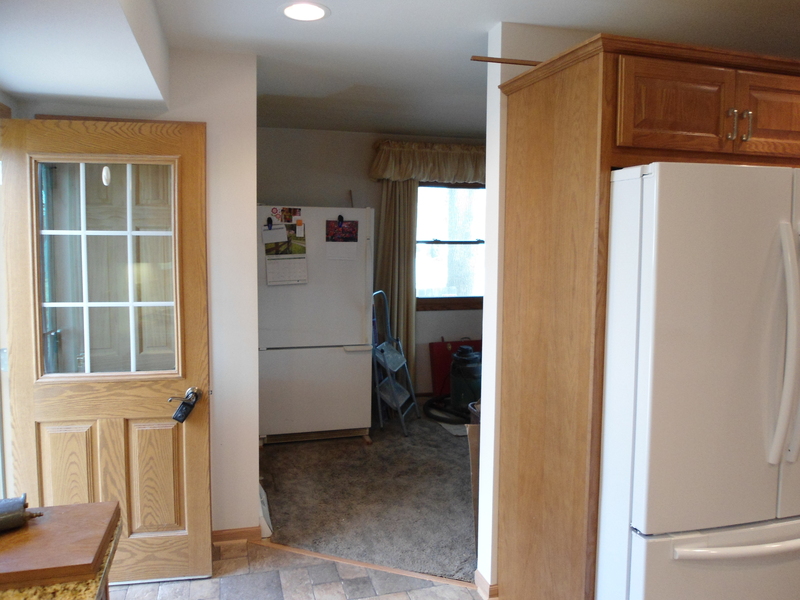 This is the area where we removed the wall so it feels nice and open when you walk in the back door. The floor was patched, but it turned out perfect. Today the tile back splash is being installed and I was just informed that the wall cabinet we are waiting for will be in today or tomorrow. Hopefully, by the end of next week we will be out of the homeowner’s hair. I cannot wait to show you the kitchen when it is done. You will see how all the details come together. I am also going to post my renderings side by side with the real thing, so we can see how accurate my drawings are.